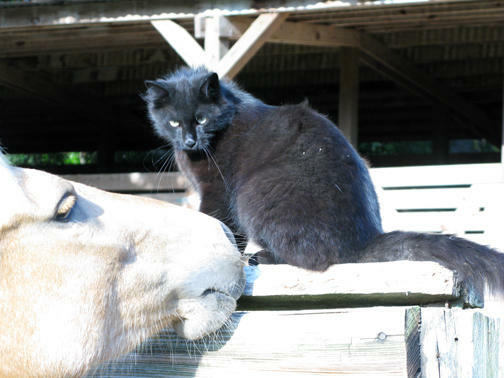 Cats are a commonly employed in stables and barns as rodent patrol. It seems these working residents develop close relationships with the horses they live next door to. 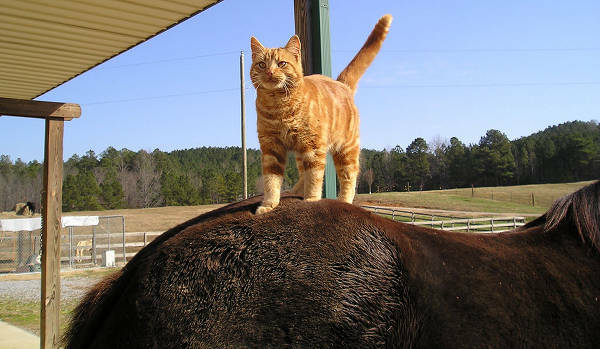 Known for their independent spirit and their fickle nature, cats seem to take a real liking to horses, and it looks like horses return the favor. 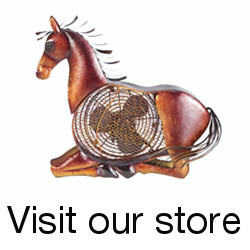 Be sure to check out horses and their dogs too. This entry was posted in Horseplay on January 8, 2009 by The Equinest. 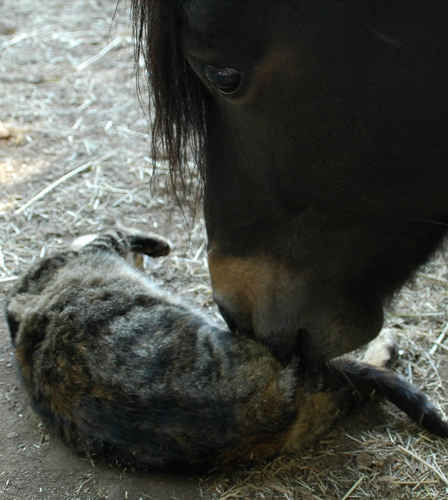 Cats are magical and even horses love them. People should relish such harmony. I LOVE horses. And, I guess, cats do to! My mini horse just loves to play with my dog. I have actually seen them play “tag”. 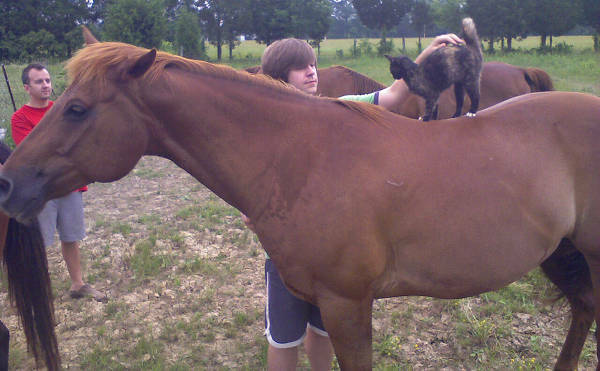 The cats tolerate the horses, but they are still young. Maybe they will learn. I just love these so much. I would be interested in purchasing 2 of the photos if they retail them. Dennis – Cats are not magical. Somebody has grossly misinformed you as to the nature of cats, or possibly magic. barharhar – bah humbug to you. Our stables in Texas, housing my QH, had cats aplenty. 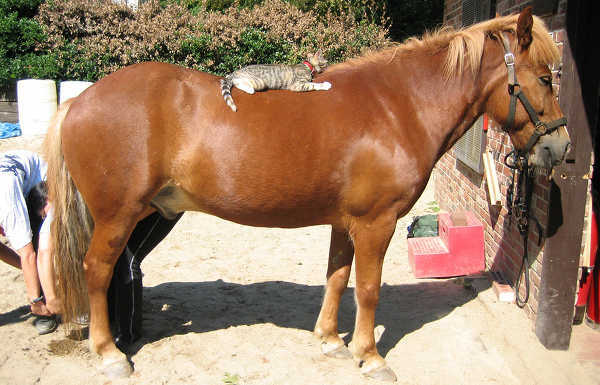 In the winter, it was common to come in the stable and see each horse sleeping with a cat on their backs. 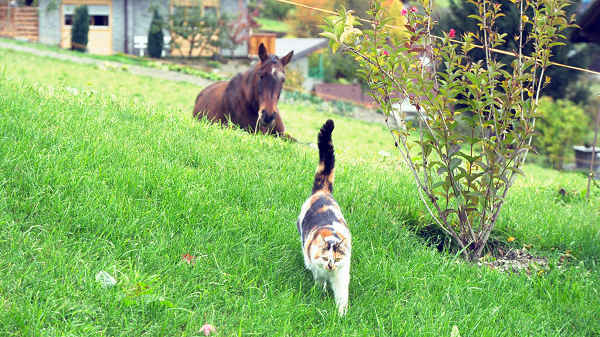 The horses seemed to take care of the cats and would watch for them. 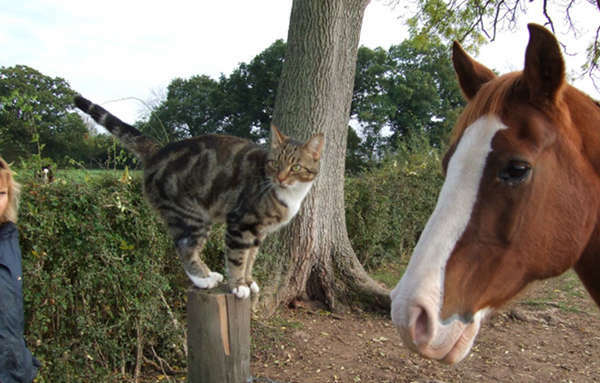 They both are non-threatening to each other and I firmly believe the horses comprehend the cat’s nature to protect the horses’ feed from rodent infestation. It’s a symbiotic relationship for sure!